Time flies. Where did the years go? How could he be so old? All those cliché lines of motherhood… why do I roll my eyes at these sometimes and at others they bring me to my knees? Today I am teetering. Yes, I am more emotional than usual these days. And yes, having him home during the hardest 3 months of my life has been both a comfort and a joy. 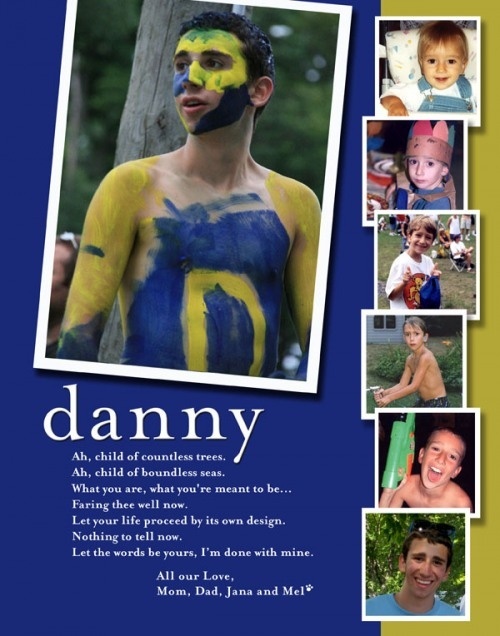 But the straw that broke this mamas floodgate today was this yearbook ad I did for my son when he graduated HS (yeh, it is both a blessing and a curse to have a mom who is a graphic designer). I came across it today on my Pinterest motherhood board (don’t make fun, I work in the mom blogger market). That ever-changing face. The same one that now sports a scruffy beard and fronts such a level head for an almost 21-year-old. This boy has turned into a man that I am so proud to say I raised. Part luck, part skill, parenting him has been such an amazing ride. I am watching him this week between an internship and the journey back for his senior year in college. Gone are my days of checklists and phone calls, Bed Bath and Fed Ex, doctors appointments and errands. He has his list and he is checking things off as they are complete. He may not handle it the way I would (seriously, Dan, are you really moving into an apartment you have NEVER seen? ), but he handles it all. Also gone are the butterflies I used to get when my children would leave. Volumes are written this time of year about the leaving of the nest – but not many write about being comfortable with the dance. If we do our job correctly, they are good to go. And we should be ok with that, even if we get a little weepy during the transitions. It is easier to build a boy than it is to mend a man. He is surely ‘letting his life proceed by its own design‘, of that I am quite certain. But he is using the foundation we built to spring from. And that is all any parent can ever hope for. Faring thee well, my (man)boy, faring the well. You will be writing the same post in 3 years, I am very sure of that. I’m crying and mine isn’t so self sufficient. Still working on it!! Beautiful. Sons some day actually make lists and check things off? Wha… A handsome young man with life skills, a good heart, strong family. Here’s hoping we can be so lucky. Oh you bet, Margi. It helps when your raw material is a Virgo, but a little nurture with that nature goes a long way. The key is to let them do it their way and only jump in when they are drowning and ask. The shutting up is the hardest part, for me, anyway.